CocoaPods is a dependency manager for Xcode projects. It is an extremely useful service to add libraries and frameworks to your project. Sometimes one makes a library so game-changing and revolutionary that it is impossible not to let the world have it. Long story short, you need to know how to publish your own CocoaPod! In this tutorial, I will be using Xcode 8 along with Swift 3. To learn more about the changes to Swift 3, read this helpful tutorial. You must also have some experience using CocoaPods. Check out this truly amazing tutorial by Gregg Mojica to learn more about it. Let’s make something groundbreaking that’s worthy of a pod. I think I want a UIView that slowly changes its color. I believe this might be useful for backgrounds. Okay, let’s begin with the basic stuff. First, create a new Xcode project and select to use the single view template. Name the project FantasticView. 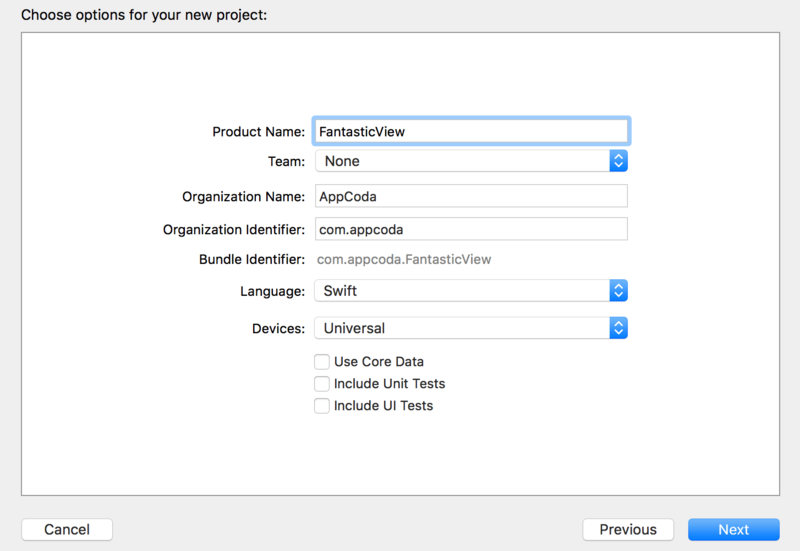 Once the project is created, add a new Swift file named FantasticView.swift. The first initializer is the init(frame: CGRect) method. This method will be called when a frame is passed to the constructor of FantasticView. We will call our color changing function here. Next, define an array called colors where we contain UIColors. In our main code, we will “loop” through this array and changed the background color of the UIView. But why do I need a counter? Aren’t we looping through the colors? Now I’m going to tell you how I dealt the problem of looping through the colors. You might think one way could be to set a bunch of colors in a UIView animation block. However, this won’t work because the final color will always be the one that takes effect. One way would be to create a for-loop and run an animation block in it. This will also encounter the former problem. To fix this, you could use GCD to wait for the animation block to finish running. But I believe there is a simpler way. You could use an NSTimer! Create a Timer object, formerly NSTimer. Schedule a timer with an interval and tell it to repeat the actions. After the set time interval, our Timer will run a code block. Call the good old animate(withDuration) function. Set the UIView.layer.backgroundColor. Note that I didn’t animate the UIView.backgroundColor because the layer property is animatable, not the UIView property. Add 1 to our counter. Let’s see what I did in #3. By subscripting colors you will get a UIColor. The colorCounter should only be a number between 0 and 5 because that is the range of our colors array. I used the % or the mod operator to get the remainder of our colorCounter when divided by 6. So if our colorCounter is 10, the output will be 4, therefore selecting the 4th option on our colors array. Here we define a FantasticView and let the frame be the ViewController‘s view bounds. Then add the fantasticView as a subview to the main view. It’s time to run the app in the simulator. You’ll see the background color changes over time. Yes, that’s right. Let’s create the Pod so people could use it! But before that, we need to push this to GitHub. CocoaPods needs a source for the Pod. In most cases, developers use GitHub for this. I will quickly go through the necessary steps to push your project to GitHub. To learn more about the basics of Git, check out this great tutorial. 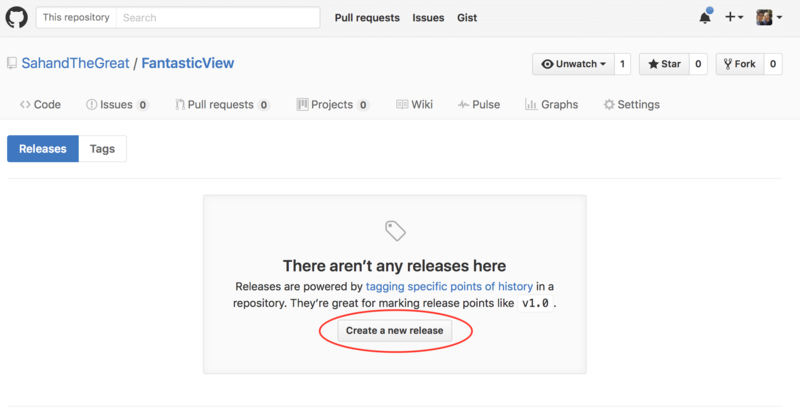 Create a repository on Github. Call it FantasticView. Copy the URL to your repo. In Terminal, navigate to your project. Add the changes: git add . Commit the changes: git commit -m "init"
Now you must create a release for your repository. A release is a new version of your product. You can create one in your GitHub dashboard. Navigate to your repository on GitHub. Click Create a new release. Set the version number to 0.1.0, then set a title and description for the release. That’s it with GitHub, let’s create the Pod itself! Now that CocoaPods is installed, you should be set to create your own Pod. To create a Podspec, navigate to your project file in the Terminal. 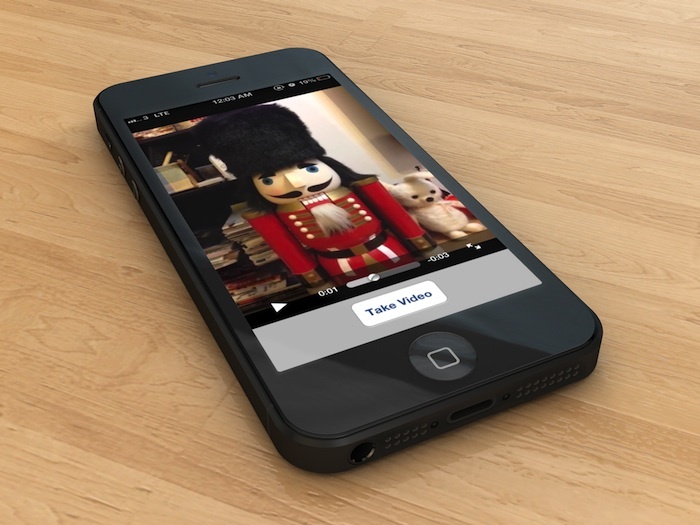 Run the following command to create the file: touch FantasticView.podspec. Now open the file using an editor. 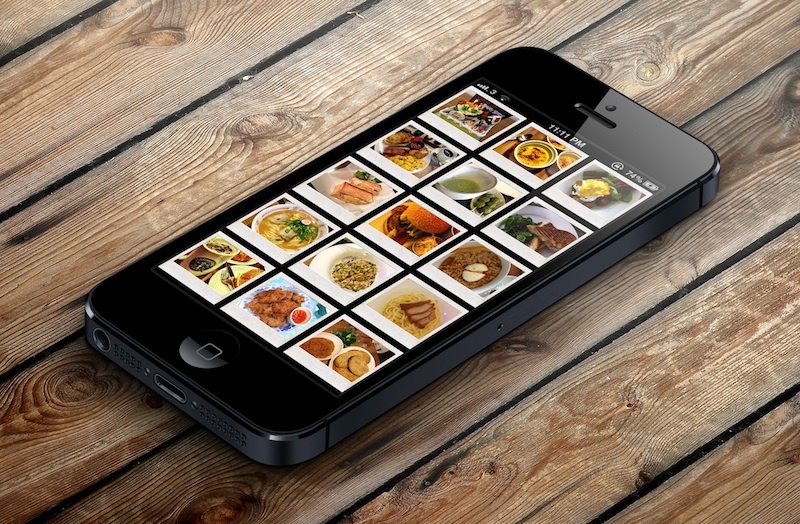 This fantastic view changes its color gradually makes your app look fantastic! These variables that come after the s are all required by CocoaPods and supply the necessary information such as the name, version, summary, description, source, source files, etc. s.name – This one is obvious. It is the name that others can use to add the Pod to their project. s.version – This is the version of your Pod. Notice that this is equal to the version number of our GitHub release. If this version number doesn’t match the GitHub release, you will encounter an error. s.summary and s.description – These two will be displayed on the CocoaPods website. Make sure that the description is longer than the summary otherwise you will encounter a warning. s.homepage – it is the source URL for the Pod. Make sure to replace YOUR GITHUB USERNAME with your username. s.author – this is where the developer’s info goes. Replace the corresponding placeholders. The asterisk * indicates that any file should be used. When the asterisk is placed before a file type, it will include all the files with that file type. In this instance, all the swift and plist files will be included. CocoaPods needs to verify that nothing is wrong with a project. This spans from limitations and requirements to errors and even suspicious code. CocoaPods requires you to lint your project. 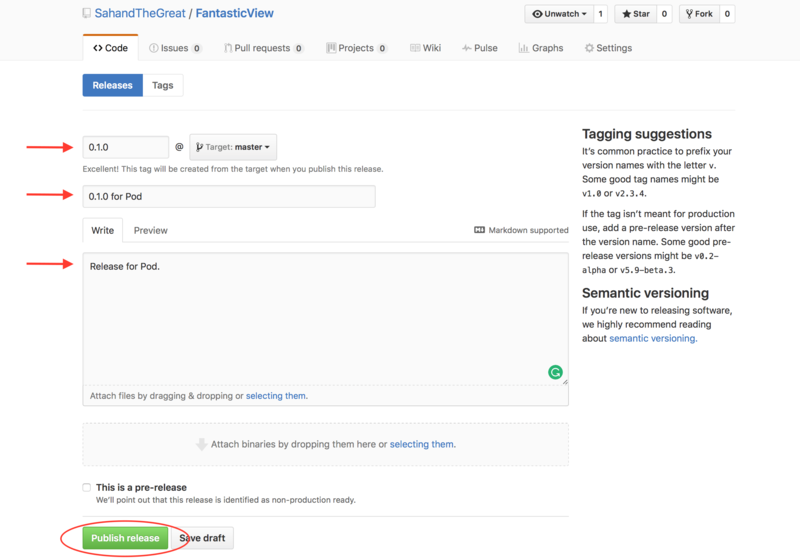 -> FantasticView (0.1.0) - WARN | description: The description is shorter than the summary. - WARN | url: There was a problem validating the URL https://github.com/<YOUR GITHUB USERNAME>/FantasticView. - WARN | description: The description is shorter than the summary. - WARN | url: There was a problem validating the URL https://github.com/<YOUR GITHUB USERNAME>/FantasticView. Warnings are pretty straight forward. In this example, you should increase your description length and submit a valid URL for your source. CocoaPods will fail the lint if it encounters an error or even a warning. - ERROR | [iOS] xcodebuild: Returned an unsuccessful exit code. You can use --verbose for more information. type UIColor has no member red. But why can’t it realize that UIColor does, in fact, have a member called red? A smart guess would be that UIColor.redColor() has been changed to UIColor.red in Swift 3.0. One could speculate that CocoaPods, or specifically, xcodebuild is compiling the project using Swift 2.2 or 2.3. The second error also confirms our speculation since NSTimer has converted to Timer. 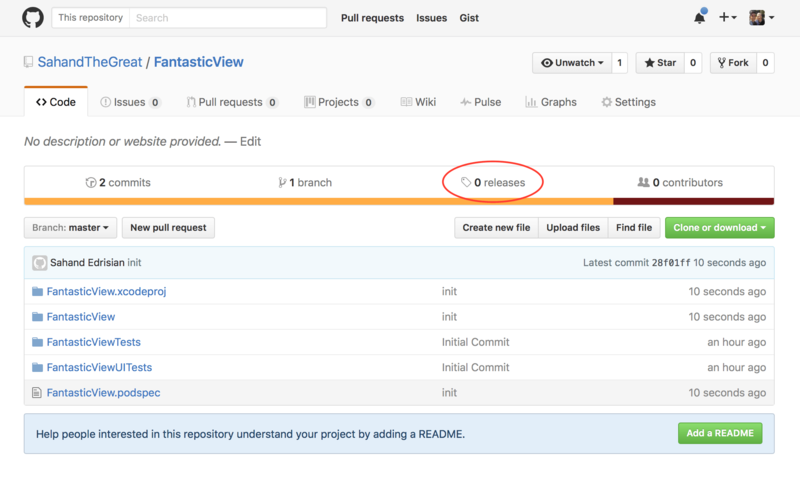 -> FantasticView (0.1.0) FantasticView passed validation. Woohoo! You have passed the most challenging part of this process. Note: If you get a vague error or warning message, try typing this command instead of the regular Pod lint: pod lib lint –verbose. This will give you a more detailed message. It’s time to publish your Fantastic View to CocoaPods. Every developer should have a CocoaPods account to be able to publish to CocoaPods. Now you might think the name of your CocoaPods account should just be called a CocoaPods account, but no, it’s a Trunk account. Now I’m not judging CocoaPods, but this is a very weird decision and left me confused for a while. You might want to read their blog post on why they made Trunk. Now Trunk isn’t exactly an account; it’s a session. So basically there is no need for a password, just an email. You should quickly get an email from CocoaPods to verify your ‘session’. Verify your account by clicking the link provided in the email. CocoaPods will greet you with friendly message: ACE, YOU ARE SET UP! Since I’ve already taken credit of this truly amazing and Fantastic View, the name is not available. You should change the s.name in your podspec and also your podspec file name. Updating spec repo `master` Validating podspec -> FantasticView (0.1.0) Updating spec repo `master` - Data URL: https://raw.githubusercontent.com/CocoaPods/Specs/06dcdf13dd11b8c2eb4fd522b25a652fa654b180/Specs/FantasticView/0.1.0/FantasticView.podspec.json - Log messages: - September 24th, 11:08: Push for 'FantasticView 0.1.0' initiated. - September 24th, 11:08: Push for 'FantasticView 0.1.0' has been pushed (0.500379641 s). - September 24th, 11:08: Push for 'FantasticView 0.1.0' initiated. - September 24th, 11:08: Push for 'FantasticView 0.1.0' has been pushed (0.500379641 s). Congrats! It wasn’t that hard after all. 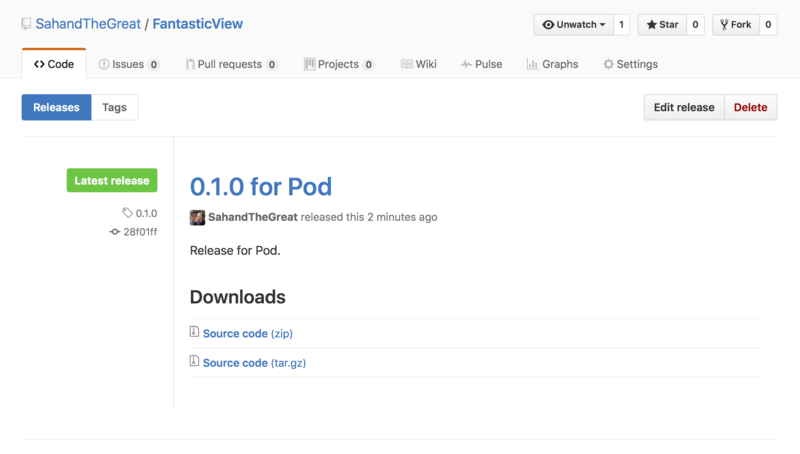 Now you can add the Pod ‘FantasticView’ to your podfile. There are a couple of different ways to push your Pod. You can create Pod projects using the CocoaPods template and house an example project, readme, license, etc. However, I found that to be slightly complicated, since it contains unnecessary steps, overhead, and confusion. In this tutorial, I created a project, added a podspec, explained the different options of the podspec file, created a trunk account and pushed the Pod. If you ever encounter a problem, you could submit an issue on the CocoaPods GitHub repo. The community is friendly, awesome, and they will always respond quickly. Hopefully, you enjoyed reading this tutorial! You can download the full project for your reference over here. 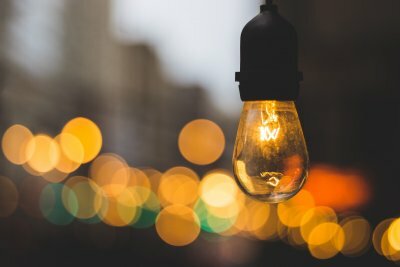 Great article, took it to bookmarks! Thanks, Sahand! [!] FantasticView did not pass validation, due to 1 error. Not sure how to fix this. I followed the steps with the exception of adding a ‘MIT’ license when I created the repo. Is that the reason behind the error? The licence file is not the problem here. Try running with –verbose and see what explanations it has. Please keep me updated! What’s the best way to include file such as images and sound in your pod and also using them within your pod files? ^ Registering with trunk has changed. A name is now required.